Metacritic tells the story of Mugen Souls fairly clearly. The critics hated it, but despite that, the community enjoyed it. It’s a shame that I never got a chance to play Mugen Souls to see whether or not I would have liked it more than my peers, but that didn’t stop me from spending the last few weeks playing through its sequel, Mugen Souls Z. I went into it expecting the worst, but it turned out to be a pretty good game after all, with deep mechanics, a massive cast of characters, and plenty of optional content! Unfortunately, Mugen Souls Z is hampered by a severe glitch that nearly every player will encounter repeatedly, which adds so much frustration to the overall experience that it makes the game much less fun and harder to recommend in its current state. Hopefully this issue will get patched within a month as promised by Houk, an Overlord on the NIS America forums, and if it does, feel free to add two whole points to the review score. Mugen Souls Z is a direct sequel to Mugen Souls, taking place immediately following the events of its predecessor. Pretty much every major character from the first game returns to the party for the sequel, and with the introduction of a collection on new characters, the cast becomes quite enormous. By the time you finish the game and see the True Ending, you will have no less than 23 main storyline characters in your party, and I have to assume that players that have played the original will enjoy the sequel that much more based on their existing attachment to the old cast prior to starting the game. 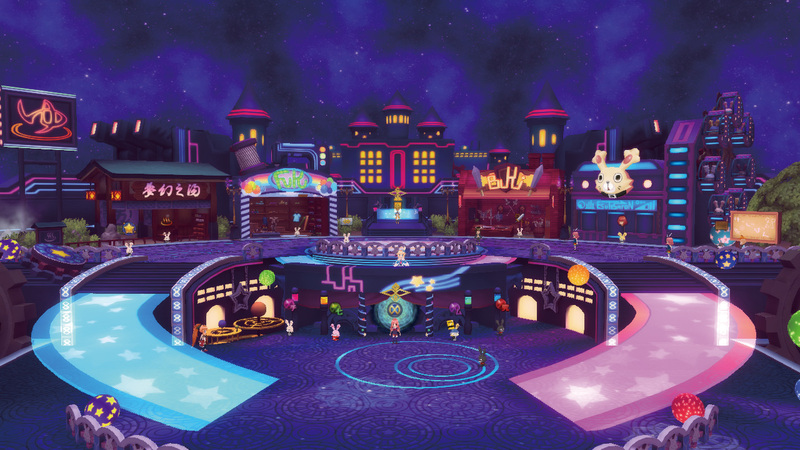 For newcomers, there is a summary of the original game posted on the notice board in the hub area, and the events of the past are frequently mentioned or briefly described as all of the characters are reintroduced. 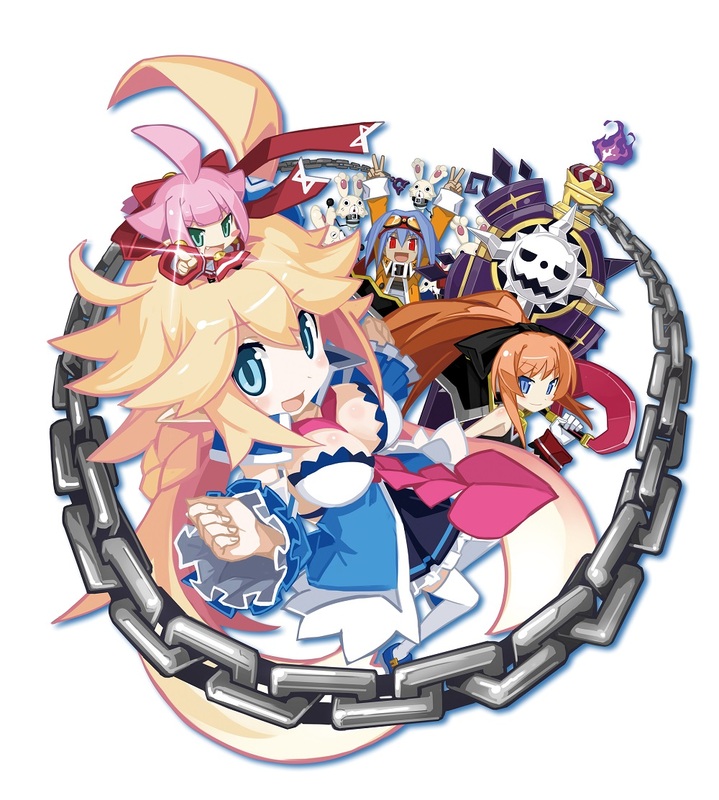 You shouldn’t feel like you have to play Mugen Souls before starting Mugen Souls Z, but I’d still recommend it, because I often wished I had known more about the original cast as they appeared throughout the sequel. This time around, Chou-Chou, the Undisputed God, finds herself in a bit of trouble when she meets Syrma, the recently awakened Ultimate God. Syrma has lost all of her powers, and needs to restore them by using the coffin she was asleep in to absorb the power of the other Ultimate Gods throughout the 12 worlds. Chou-Chou somehow gets pulled into the coffin (and gratuitously covered in pink sticky goo), Syrma ends up with her powers (assuming the role of main character in the process), and Chou-Chou gets shrunk down to such a small size that she spends most of the game barking orders while mounted on the top of Syrma’s head. The storyline is told through extremely long cut scenes where the characters ramble on and on about whatever precarious situation they find themselves in, while actually being far more concerned with the ways their personalities clash and repeatedly stating the obvious. The storytelling is extremely lighthearted, with small bits of real storyline progress being frequently interrupted by pointless arguments, gratuitous fan service, and circular conversations. Despite how negative this all sounds, somehow it works a bit better for Mugen Souls Z than it might for another game. The characters themselves adhere unfalteringly to a variety of cliché anime roles, and it just feels natural when they are inevitable at odds with each other. Many of the scenes overstay their welcome, dragging on for far too long, but on the other hand, it’s nice to see a game spend so much time and effort on character development. There are moments where it gets pretty funny as well, but your mileage may vary. But more than anything, the game and its writing seems designed to appeal to as many fetishists as possible, and the developers never missed a chance (or persistently forced themselves) to dress all of the girls up provocatively, frequently strip them down to their birthday suits, and of course, cover them in pink goo while they make squirmy noises. There was even a mini game where the player could wash the girls in the bath, but NIS America ended up making the difficult decision to cut that out of the game for the North American release, as it was deemed inappropriate. Frankly, given the amount of skin on display in this game, I’m surprised that that’s where they drew the line, but given the childlike appearance of some of the characters, it isn’t so surprising. 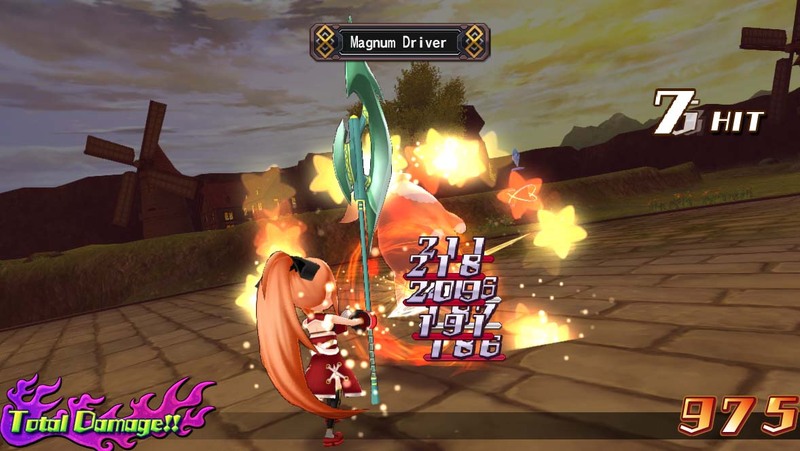 What sets Mugen Souls Z apart from other RPGs is its mechanics, which are numerous and varied. There are so many, that nearly 50 tutorials are used to describe them. After a while I just felt overwhelmed every time a new mechanic was introduced, but as I got more used to the game, things started to make a bit more sense. Now that I’ve finished the game, I feel like I’ve really gotten the hang of it, but even now there are aspects of Mugen Souls Z that I am confused about. Nevertheless, I learned how to make my characters strong enough to survive the greatest challenges of the main storyline and combat, but I definitely wouldn’t recommend this game to a genre newcomer. This is a typical battle in Mugen Souls Z. At its most basic form, the battle engine in Mugen Souls Z isn’t that dissimilar from other games of the genre. 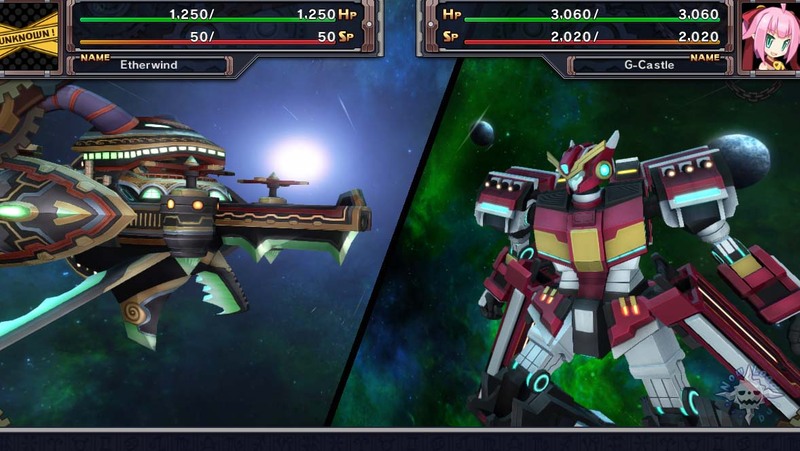 Each character has a “move” stat which determines turn order, and all of the characters and enemies take turns moving around the battlefield and attacking each other or using skills or items. It’s kind of like Star Ocean in terms of character positioning and Final Fantasy X for turn order. 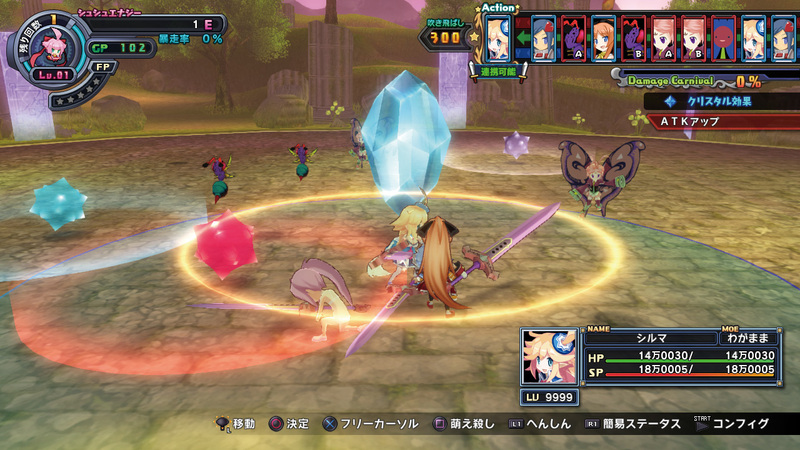 Mugen Souls Z also borrows several mechanics fromthe Disgaea series. There are crystals that appear around the battlefield which cause effects within their radius such as increasing physical damage, lowering evasion, reversing damage or even providing invincibility. Characters can be strengthened to level 9,999, and the weapons and armor they equip can be leveled up as well, eventually leading to ridiculous amounts of damage (there’s even an achievement for dealing 100,000,000 points of damage)! And the hub world, stat types, interface, music, storyline, characters, optional 100 floor dungeons and pretty much everything else seems strikingly similar to what you might expect from a Disgaea game. The hub has everything you need to prepare to deal lots of damage. But Mugen Souls Z doesn’t stop there, it layers more and more complexity on top of the existing aspects of gameplay we might already be familiar with. Enemies can be lifted off and bounced around the battlefield, crashing into each other and the player’s characters indiscriminately, dealing damage and adding to combos that add a multiplier to the rewards provided at the end of combat. This is one of the methods of destroying crystals with pesky side effects. And if that isn’t enough, you can also launch enemies up into the air, knocking floating boxes out of the sky which can turn into new crystals, items or even more enemies. Deal enough damage in a single battle and you’ll trigger the damage carnival, further increasing bonuses! And if you manage to destroy the crystals in battle, you can go into fever mode, which adds balls of light to the sky which act kind of like the bumpers of a pinball table when you launch enemies into them. Once again, doing this leads to better rewards. Is your brain melted yet? Don’t worry. That’s pretty normal for this game. All I can say is stick with it, and it will all eventually make sense. But wait—there’s more. 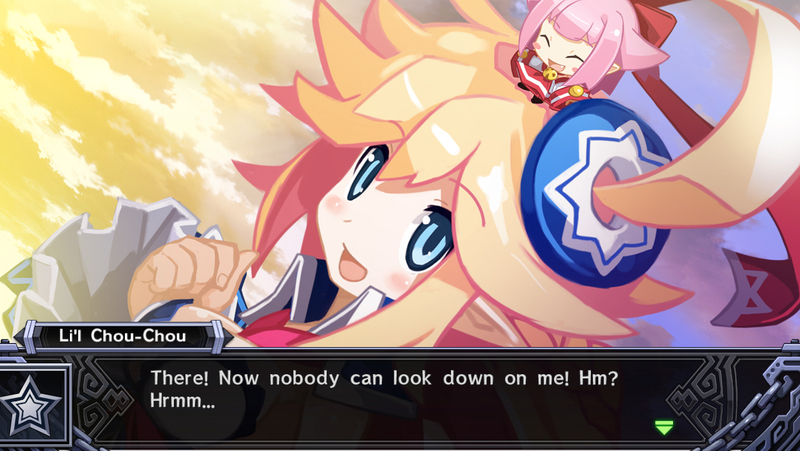 The “captivate” mechanic returns from Mugen Souls, and involves forcing Syrma to act out one of eight fetishes in order to win over her enemies’ hearts. Okay, so they call them affinities, not fetishes, but nevertheless, the idea is to “match your enemy’s desire to improve your performance.” The affinities include Sadist, Masochist, Graceful, Ditz, Hyper, Terse, Ego and Bipolar. …yes, Bipolar. That’s a fetish now, apparently. It doesn’t matter whether it’s a random enemy or an entire planet; Syrma can figure out what they’re into and make them completely fall for her by posing in various positions, shouting out little phrases and acting generally suggestive. Successfully captivating a planet usually leads to storyline progress, though it can be frustrating when Syrma has not leveled up her affinities enough, bringing progress to a grinding halt, literally. When this happens, the player has no choice but to captivate as many enemies as possible, turning them into Peons called shampurus, which are weird little rabbit things. Collecting enough of these makes Syrma more effective at captivating and also increases the power of G-Castle, which is both the ship that Chou-Chou commands and a battle fortress for large scale encounters. First I’ll use Pierce. Then, I’ll use Pierce. After that… Pierce! These 1 on 1 battles are not unlike rock paper scissors. Both the G-Castle and the enemy ships all use the same skills, which include attacks, recovery skills and defensive skills. The idea is to try to predict what skill your opponent will use, and use the appropriate counter measure. The problem is that it’s kind of like playing rock paper scissors and shouting “chainsaw!” instead of one of the usual choices. There is a skill called Pierce which trumps everything. It breaks through the defensive skills, and it still does damage against attacks skills and recovery skills. Almost every G-Castle battle can be won by spamming Pierce. The only time this isn’t the case is if you have not collected enough shampurus to level up your G-Castle, and you might have to pause you Pierce spam in order to recover a bit before resuming and winning anyway. In the end, this entire mode of battle is undermined by the power of Pierce, but fortunately, you rarely fight with G-Castle throughout the main storyline. Nevertheless, it still behooves the player to collect as many shampurus as possible because there are a few mandatory G-Castle battles, especially on the path towards the True Ending, and the True Ending also requires that each of Syrma’s affinities be leveled up to at least 15. And since the player needs to collect so many shampurus, the entire battle engine becomes somewhat irrelevant. If you win every battle by captivating, you won’t ever need to swing a sword or cast a spell. All you have to do is level up Syrma as much as possible, equip her well enough to survive, and have her captivate everything while repeatedly defending with the rest of your party. So much for that huge cast of characters! They’re all on the sidelines it seems, at least until the boss battles. There is one area of the game where you can really put your characters to work. It’s called the Mugen Field, and it is basically a battle gauntlet. When the system is first introduced, the Mugen Field is only 10 floors (battles) deep, but later in the game this can be expanded to 30, 60 and 100 floors. The Mugen Field is kind of like the Item World from Disgaea. You can only escape by using an item or by reaching specific floors, and the challenges you face are fairly random. You never know what kind of enemies you will encounter, what kind of crystal effects will be in play, or if you might bump into a G-Castle battle. There are usually boss encounters every 10 floors or so, and the rest floors (such as 10, 30 and 60) also have bosses on them—though these are optional—as well as random treasure, random merchants, random healers and even a few storyline elements (that are surprisingly required for the True Ending—don’t miss the scenes that are only available in Chapter 7!). The Mugen Field is by far the most compelling aspect of Mugen Souls Z from a gameplay perspective. The player has to wager some currency before entering the Mugen Field, and the size of the wager determines how strong the enemies are. Needless to say, they can be made extremely powerful, and players that delve into the postgame content will certainly want to explore every facet of this mode and level up their characters and gear to be able to survive. While many of the complicated mechanics of Mugen Souls Z can be safely ignored throughout the storyline, making the most out of each trip into the Mugen Field requires a deeper understanding of those mechanics. It also requires taking advantage of every way the game allows you to develop characters. For example, Mugen Souls Z allows you to create characters from scratch that belong to a variety of classes, and there is a mechanic similar to reincarnation from Disgaea where characters are reverted to level 1, but they have stronger base stats and can inherit skills from other characters. There really isn’t any reason to bother with any of that during the main storyline, but the Mugen Field provides enough reason to start utilizing that mechanic in the postgame. Since you can level up so quickly in the Mugen Field, it isn’t so bad leveling up new characters or characters that are starting from level 1 again, and the player can also choose to handicap themselves (by disabling certain ability types, items, features, etc.) to add multipliers to the experience and rewards gained while exploring the Mugen Field. Here’s Nao letting off some steam in between complaining about everything. In many ways, the Mugen Field is a grinder’s paradise; many ways except one: the crash. As I mentioned at the start of this review, Mugen Souls Z contains one severe glitch. It is a crash that can happen at the start of any floor in the Mugen Field which forces the player to manually power off the PlayStation 3. Since there is no way to save between battles, a crash can result in a complete loss of progress since the last rest floor, and the crash occurs often. My experience has been pretty awful, to be honest. I’d say I suffered this crash 50% of the time that I attempted to go through 10 floors in a row. There are many theories about the source of the crash, but regardless, it absolutely destroys the fun factor of the single best part of Mugen Souls Z, and though I forced myself to grind through the Mugen Field enough to see the True Ending, I have absolutely no interest in exploring the optional content that is entirely dependent on the Mugen Field until this bug is patched. When I beat the game, I wanted to keep playing, but I just can’t do it when so much of the experience is rebooting the PlayStation 3 instead of playing the game. It’s a shame, really. Shame; that’s the word that best describes this whole situation, because really, if it weren’t for those persistent crashes, Mugen Soulz Z would be a solid 7 in my book—maybe even an 8. The gameplay is there, the music is good, the characters are quirky and fun, and there’s just a ton of interesting mechanics that you won’t find anywhere else. There are weaknesses too, like the main storyline that hides behind the character’s casual banter more often than not, the sharp difficulty spikes that almost always force a trip into the Mugen Field for grinding, and a surprisingly low frame rate for a game that is not too graphically intensive. But as a whole, Mugen Souls Z is a good game, and the bug just drags it down so severely. So yes, it’s a shame that I can’t tell you to go out and play Mugen Souls Z today, but I can tell you to play it in a month or two once it has been patched (with any luck), especially if you enjoyed the original. Ari completed Mugen Souls Z in 42 hours. He received a copy of the game from NIS America for review purposes.